One size does not fit all for appliances, and one common mistake homeowners make in a kitchen remodel is choosing a refrigerator that is not to scale for the space- either too big and in the way, or too small and leaving gaps. While appliances are a good starting point, every element should be to scale so you don’t draw attention to the size of the space. It is important to remember that the purpose of having a kitchen is meal prep, so making sure the space is functional should be the priority of a kitchen remodel, with aesthetics following. 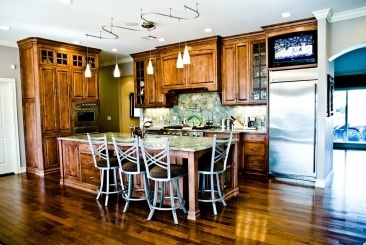 Some factors to consider are the layout of the sink, stove and refrigerator as well as both prep room and storage room. Whether you have a historic older home, a luxury high rise unit or just a more compact floorplan, focus on what is great about the space. When you are positive about the project you can open your mind to the details that can make the space great. Working with a professional can also help you understand where you might be able to refigure space to increase the kitchen area. You may decide to add or enhance the lighting, choose a lighter palette or open up walls of the space. There are several ways to make the space feel larger. If you have walls that can safely be opened to adjoining spaces, you can consider creating a breakfast bar or island for seating, serving and prep space. Before making that level of changes, call in an expert to check the structural impact to your home.